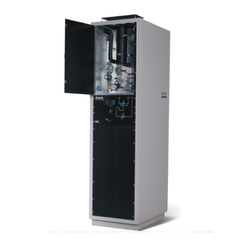 The calorimeter is non-recording and flow type in which calorific value is as certained from the rise of temperature imparted to a measured quantity to gas. We are offering Junkars Gas Calorimeter to our clients. (Used for finding out calorific value of gaseous fuels) The standard equipment consists of chiefly the calorimeter with burner on Tripod stand, gas flowmeter (Non recording type) pressure governor. This calorimeter is designed to cover a wide range between 120 B.Th. U and 3000 B.Th/Cu.Ft or 26000 K.
- To determine Calorific Value of Gaseous Fuels. Stainless steel shell and tube plates with 70/30 cupro nickel tubes and stainless steel end covers, with pressure release valve in water jacket. Advanced Technocracy Inc. is Manufacturer, Exporter & Supplier of Exhaust Gas Calorimeters. 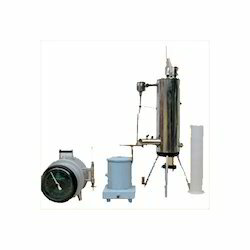 The instument consists of Calorimeter with Burner on Tripod stand, Gas flow meter (Digital Mass Basis) and pressure Governor. The Calorimeter measures the calorific value of gaseous fuels from 120 B.Th.U. to 3000 B.Th.U. (1000 to 26000 K.Cal./Cu Meter). It also consists, measureing Jar of 2 Lit. cap. and 50 ml. cap. with rubber tubing for gas water connection. Junker's Gas Calorimeter used in Petroleum Industries/Laboratory & R&D Centers, Coke Oven Batteries, Thermal Power House Cement Industries, Gas Companies, Steel Plants and Fertilizer Industries. We are a most trusted name in between the topmost companies in this business, instrumental in offering a high-quality array of Boys Gas Calorimeter.